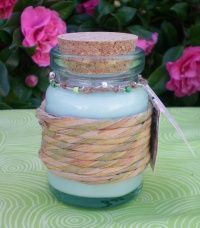 Handmade soy candle in an 8 ounce recycled glass jar with decorative raffia and a cork lid. 100% Recycled glass, made in Spain from rescued bottles. Select your choices from the menus below and I will make your candles fresh for you.